My apologies for being a bit sparse with new recipes. This past week has been FILLED with cooking, but not a whole lot of downtime. I love what I do! It’s so fun being able to feed people and feed them well. This dish works surprisingly well for both warm nights on the patio or chilly nights at the dinner table. The orange livens up the earthly taste of the beets, and the pistachios add a pleasant ‘crunch’! Make sure to use fresh herbs and grass-fed meat for this healthy and satisfying meal. 3 large beets, peeled and sliced into half moons. Toss beets with orange juice, oil, salt, and zest. Spread evenly on the sheet and roast for 20-30 mins. Season steak with a little salt and pepper. Light the BBQ or heat a grill pan. Sear for 2-3 mins on both sides and let rest for 5 mins. Remove beets and toss with chives and pistachios. Using a blender, add all the ingredients for the dressing except for the olive oil. Mix well and add olive oil slowly while blending. 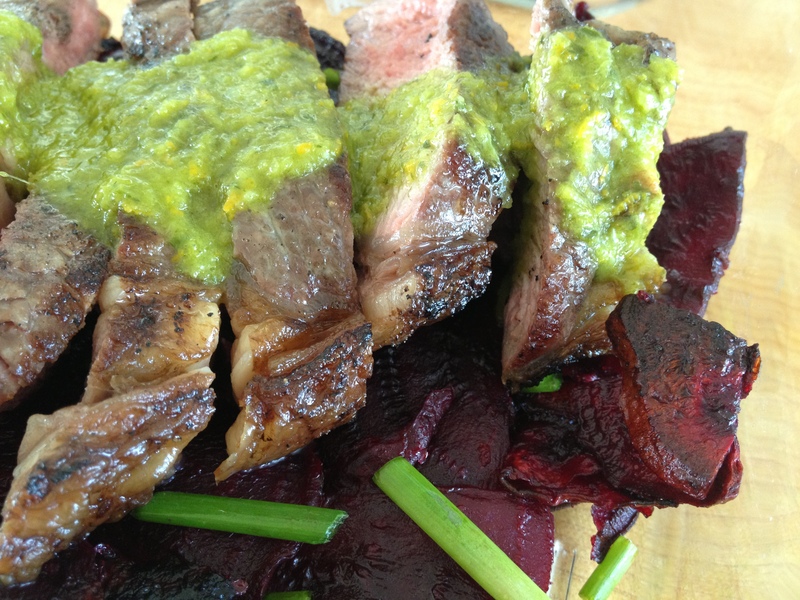 Slice steak thinly and serve over beets with a drizzle of vinaigrette.